Cool Water by Dianne Warren. HarperCollins 2010. The Governor General’s Literary Awards are awarded annually to the best English-language and French-language books in each of seven literary categories. The winner of each category receives $25,000 and publishers of winning titles receive a $3,000 grant for the promotion of the prize-winning book. 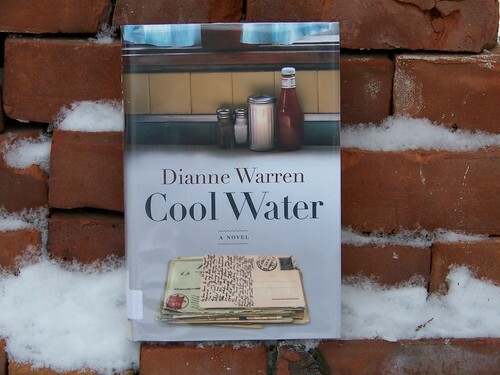 In 2010, the winner of the English-language fiction award went to Regina writer Dianne Warren’s novel Cool Water. But look closer, baby, you’re so wrong! Warren looks closely, examining the highs and lows, joys and tragedies that compose everyday life. The story begins with a horse, a good place to start. In the deep of night, a little grey arab gelding escapes from where he is tied in a campground near Juliet and makes his getaway. A little while later, he is discovered by Lee, who is up late, sleepless, while the events of his life haunt his tired thoughts. Lee saddles up the horse and sets out on a ramble that will, unplanned, become a 100 mile marathon and his trip becomes a narrative ribbon that ties together the events of the upcoming day. As the day begins, readers meet Willard, a shy older man grappling with his inability to recognise and express his love for Marian; Vicki and Blaine, struggling with the overwhelming dept that threatens the family homestead; their oldest son Shiloh, who at 12 is trying to make sense of the world he lives in; Norval, the town’s banker, who too often must deliver bad news to stricken farmers and is depressed and burdened by his duties; and a host of other town residents, each doing their best to cope with what life brings them. As a horse owner, and more particularly, the owner of a little grey arab, I enjoyed Warren’s references to the legendary ability of arabians to ‘go the distance’. Arabians are always well-represented in 100 mile endurance rides. Ninety-five percent of the winners of the Tevis Cup have been arabians or part-arabs. I was a bit bothered by Warren’s representation of Vicki, who seems to be absolutely clueless, unable to grasp the desperate state of the family’s finances, still making unnecessary jaunts to town and indulging in frivolous purchases just for the pleasure of buying. Norval’s wife, Lila, also comes across as a bit of a ditz. Surprisingly, when tragedy strikes, she seems to be coming into her own, as if she had merely been playing a role until this point in her life, an ironic spin on her failed theatre-arts background. Cool Water is elegantly written, with the deceptively simple storytelling style neatly bringing together diverse tales with considerable insight into the human condition. Once begun, Cool Water is hard to put down as you become wrapped up in the lives of Juliet’s citizens. This novel is a worthy award-recipient and recommended as a memorable read. This entry was posted in Governor General listed and tagged Cool Water, Dianne Warren, Governor General award 2010, Tevis Cup. Bookmark the permalink. This one sounds good. I’ll look for it the next time I go to the library. I think you’d enjoy it, eyegillian. Yes, they do, Melwyk. Thanks for dropping by!